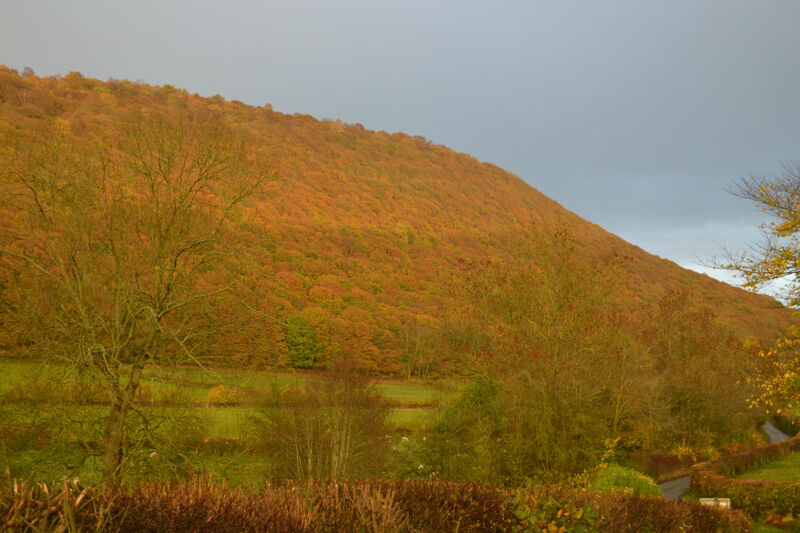 One of our rooms is named after the massive oak wood that flanks the northern slopes of the Redlake Valley at Chapel Lawn, bringing a beautiful green backdrop in Spring and Summer and wonderful golden-brown colours in the Autumn – but is it Bryneddin Wood or Brineddin Wood? Some of you will know I’m a bit of a Spelling Bee at heart and the extremely observant ones amongst you (hmm..) will have noticed a recent change in the spelling on our website from the ‘y’ version to the ‘i’ version. The reason for this is twofold. Firstly, we were privileged to attend a talk last week by Alan Reid, a Forestry Commission Ranger for South Shropshire whose job involves going out (mostly in the dark with a lovely black Labrador, now there’s a challenge…) and looking for wildlife in the woods – getting up close and personal with owls, foxes, deer and even the odd pine marten or two. Alan showed photos of all creatures great and small and talked about some of the wildlife conservation initiatives in the area. The talk was arranged by our local Redlake Valley Community Benefit Society, so I’ve been looking a bit more closely at what members of the Society have been doing to maintain the quillet that they own. “What’s a quillet” I hear you say…well the detailed answer can be found here on the RVCBS website – but in short, it’s a strip of woodland which in this case is within Brineddin Wood, directly behind School House. Members of the RVCBS have built steps up the steep hill and there’s a bench or two to sit and watch the woodland world go by. We’ve seen several school parties walking along the edge of the wood as it’s a great place for kids to come and enjoy and learn about the great outdoors in a safe environment. So the first reason for changing the spelling to Brineddin is that the RVCBS spell it that way on their website and all their promotional material, so if it’s good enough for our local nature buffs then it’s good enough for us.